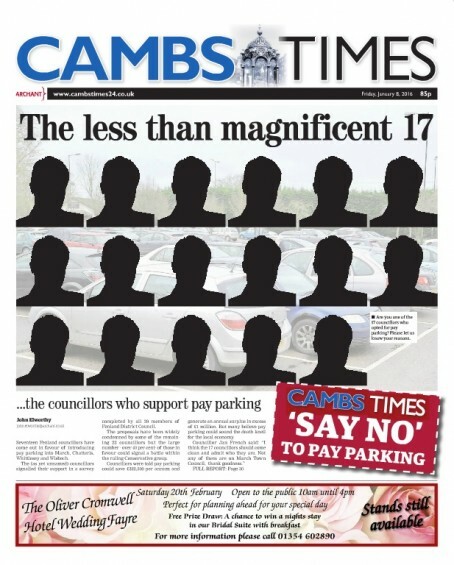 The Cambs Times launched its ‘Say No to Pay Parking’ bid after Fenland District Council, in North-East Cambridgeshire, revealed it was considering ending years of free parking as part of a round of budget savings and cuts. Editor John Elworthy said he was “staggered” to find 17 councillors had replied to a council survey on cuts supporting the idea, despite “universal opposition”. As a result, the Times threatened to ‘out’ the 17 in favour on last Friday’s front page, below, despite their names not being known at the time of going to print. Said John: “With the possibility of pay parking coming in we felt it was time to act. Calls began to the authority’s 39 councillors and a Freedom of Information request was being prepared to the council to confirm the names of those in favour. On Thursday, six days after the paper published the outline of its campaign, a private meeting of all councillors was told by council leader John Clark he didn’t feel his colleagues “had the appetite for it”. The charges, which might have raised £1m a year, were widely condemned with many readers telling the paper they felt it could destroy already struggling market towns. John added: “Within days councillors were telling me they were ‘feeling the heat’ and it quickly became clear councillors didn’t have the stomach for it. A six day campaign? In a weekly newspaper? Web aside, that’s just one story isn’t it? Good work but not really a campaign. There was a six-day war as well, but the fact it was only six days didn’t mean it wasn’t a war. Good job Cambs Times. Shows that the press, even in these declining days, still has the power to get things done. Sadly typical knee-jerk pandering to the noisy Clarksonites. Some intelligent analysis and evaluation of the tough decisions councils have to make would be better. Why does every local paper in the country seem to be so driver (sorry ‘motorist’) obsessed? It’s a striking front but it could come back to bite them. Sometimes a campaign can be successful by simply reporting the case, the evidence or the weight of views for or against something. Last year my local district council was looking at filling funding gaps by introducing parking charges. The town council that served the area and my newspaper patch strongly disagreed with such charges. Then it discovered that no parking charges meant the town was being used as a park and ride as shoppers and commuters took the train to larger towns nearby, leaving their cars clogging the free car parks. Thus, it is now more open minded to such suggestions, or at least restricting free parking to 2 hours. Anyway, well done to the paper for its campaign. Parking stories are a mainstay of good community weeklies. It is an issue that readers get worked up about. Great story – and it’s good to see that the paper is still planning to out the 17, if it can get the names. Politicians, local or national, who think they can treat private vehicle owners as a cash machine, do so at their electoral peril. Anti car parking charge increase is an easy campaign because most of the public are going to support it. Good presentation but I can’t help thinking it was wasted on such a relatively trivial subject. How about photographing people who still insist on driving while hand-holding phones and putting that on front. Councillors are easier prey. But you can’t argue with fact the paper won the day.